I had no idea that the Oakland School Board was back up to its old tricks. I picked up a copy of the East Bay Express and was surprised to see that the board has put another $120/parcel tax on the ballot. A quick web search indicated that there wasn't even an argument submitted against the tax. I wonder how many Oakland residents realize that this is a duplicate of another $120/parcel tax the district is already levying which passed in November, 2014. And that's in addition to a longstanding $195/parcel tax that's already on people's bills. I actually support these taxes because they're regressive and they promote gentrification. But, I suspect most Oaklanders should not support them. That's why I returned to my long-dormant blog to at least say something about it. If Measure G1 passes, the school district will be levying $435 per year per parcel on homeowners, many of whom can't afford it or have fled the still-floundering school district. Sure, the duplicate $120/parcel taxes have low-income protections to make sure the truly poor don't pay them. But, the vast majority of Oaklanders don't qualify (and it sort of has to be that way, otherwise they wouldn't raise any money). I'm not up on rent control, but my vague recollection is commercial properties can pass this tax along to renters. I guess $10/month of additional rent isn't that much, but it does add up. Anyway, I support the tax because, like most liberal policies, it pushes out the poor and encourages gentrification. But, most Oaklanders should probably not support it. Can Oakland do this too? Today's NY Times article about restorative justice programs in schools pushes the agenda that schools should be trying to "fix" kids with severe social or discipline problems. I'll be honest that the Measure Y poster in the background of the photo accompanying the article didn't improve my mood on reading it. What a con job that was. Pretending to hire more cops so they could funnel more money to terrible social programs. I don't really care what Oakland does with problem kids in the schools. My reading suggests the only thing that has any real chance of working is to take them totally out of their environment by putting them in some kind of boot camp program. I assume that's why the most successful inner-city charter schools keep the kids in school 10+ hours a day. These programs are a shame because there are smart kids in these schools. But when the funding comes, they're overlooked in favor of trying to "fix" the problem kids. That's the wrong approach. Most problem kids will never amount to anything no matter what you do. Stop wasting money on them. And, if you're going to spend money on them, take them out of schools and make them break rocks or cut trails in the Sierras or something. Get them out of that inner city environment. But don't do this. Open a magnet school to empower the smart kids. The face of Oakland is continuing its rapid transformation as gentrification draws new families to the area and displaces others. I crunched the numbers for the past 20 years and came up with a pretty interesting chart showing how Oakland Unified's enrollment has changed. I suspect this is a common theme across all big California cities. But still, I'm not sure people in the Bay Area realize the extent of the transformation. Since the year 2000, the change is striking. 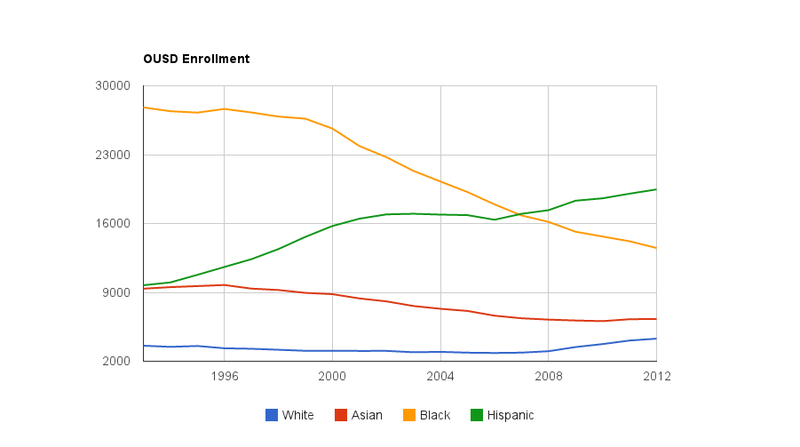 Total enrollment is down about 15 percent, while black enrollment has dropped almost in half. Meanwhile, Hispanic enrollment is up about 23 percent, and white enrollment has climbed 40 percent. This is not a step-function change. It's ongoing. In just the last year, Hispanic enrollment went up 2 percent, while black enrollment dropped 5 percent. In fact, pretty much every year OUSD's black enrollment drops by about 500 students. White enrollment increased almost 5 percent in the past year. I'm not sure what all these changes mean. I do know that large areas of Oakland suffer from reduced residential values almost completely because of the school system (crime plays a role as well, but schools are the controlling factor). Scores are improving, and that is probably causing more upper-income families to consider sending their kids to public schools. Meanwhile this huge demographic shift is underway. One other thing I'd note is that some of the top-API schools in Oakland are charters, including the very successful KIPP school, which has almost 100 percent minority students. Point being, looking at ethnicity doesn't tell the whole story by any means. Given this backdrop of improving conditions, it would be great to see Oakland open magnet middle and high schools. Amid the constant reports of burglaries, murders and other crime problems in Oakland, it's surprising to see Oakland in the middle of housing bidding wars. Here's an article you should check out. I'm not sure it's particularly actionable, but it's interesting nonetheless. Buyers looking at homes priced at $1 million and above in the Oakland area are bidding 20 percent to 40 percent above list price, Garner said. To drum up sellers for her buyers, Garner's getting in touch with the owners of last year's expired listings. She also advises buyers to talk to their friends, and at community gatherings like farmer's markets she puts out the word that it's a sellers' market. The buyer had made an offer on a home but lost out when the home sold for $400,000 more than the list price. Her client could have afforded to purchase at that price, but got cold feet about paying so much above the list price -- about 30 percent -- and dropped out. I believe a key background to all of this is the rapid progress of gentrification in the area. 34 Oakland Black Kids With Perfect Scores; Why No Magnet School For Them? I was really heartened to see an article today about 34 black Oakland Unified kids who got perfect scores on their STAR tests. Here's a link to the article. It looks like they're mostly on the younger side, but old enough for the tests to be meaningful. The article also doesn't say which schools all the kids attend, but I'm sure it's safe to assume not all go to the nicer hills schools. Everything I've read on the topic indicates that a big change tends to happen around middle school, when the problems of Oakland take their toll on kids, making it impossible for them to progress further in school. Why won't the district put in place a magnet school? For the sake of these 34 kids, along with the countless kids of other races who do well at OUSD, you'd think it would be worth it. Here we have crystal clear evidence that such a school wouldn't just be for the privileged white hills dwellers. And, when these kids continue to excel, they'd serve as role models to other young kids. A magnet school would maximize the probability of each kid succeeding. The truth is, OUSD is run for the teachers' unions and for the sake of political expediency. If not, they'd be setting up a magnet school right now. I enjoyed reading this interview with Rick Holliday, who is now finding more success selling units at his Pacific Cannery Lofts project. Of particular interest is his description of a potential future for West Oakland. He talks about biotech maybe moving in as Emeryville becomes saturated.At a minimum, the fact that he's managed to sell all those condos indicates people see the logic in living near the East Bay's best BART station. I park at West Oakland BART occasionally, and I've noticed a dramatic change in the demographics of the folks heading out into the neighborhood after their train ride. No question West Oakland has a number of strikes against it, including the proximity of the pollution from the port and all the permanent low-income housing around. Still, I think there are enough brave souls around willing to move in. Hopefully, 10 or 20 years from now, the only truly bad areas of Oakland remaining will be to the southeast of Lake Merritt.